Specialized's mission is simple—to be the brand of choice for discerning riders. Founded on performance and fueled by innovation, our focus on the rider and their needs is our constant. From seasoned pros and weekend warriors, to kids and commuters—if you ride, we’re for you.We believe bikes have the power to change lives. This simple truth drives us to be—and do—better. The passion we have for sharing our love of bikes with the world can be seen in those who choose to work here, and the people and organizations we partner with. 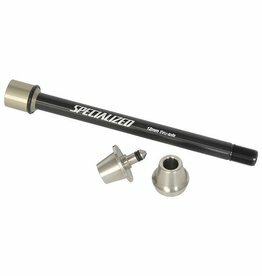 Use your 142+ Specialized bike in a rear wheel stationary trainer with this adapter.